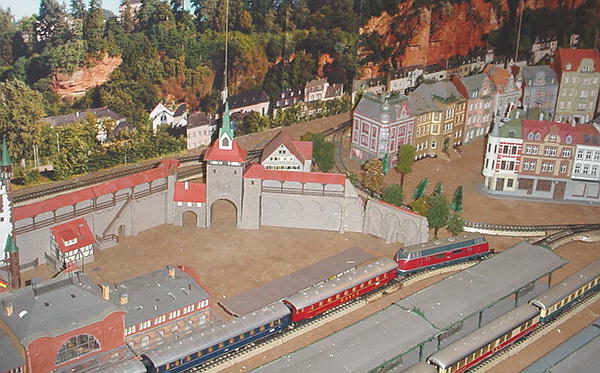 Great mint or used European model trains at inexpensive prices from Germantrains. 3 rail AC - If you can't find it here, please send email. I can probably get it. Class 53-0001 prototype that never made it into production. This huge "Mallet" locomotive with a 2-6-8-0 wheel configuration with a five-axle tender had been designed by the Borsig factory during WW-II for use by the German army on long-distance runs with heavy trains. Due to the events of the war it was never produced, however. Marklin created this impressive model with a total length of 12-1/2 inches in length. You may want to read more about the history of this locomotive by clicking here. DB class 03-1022 "Pacific" steam locomotive with tender. 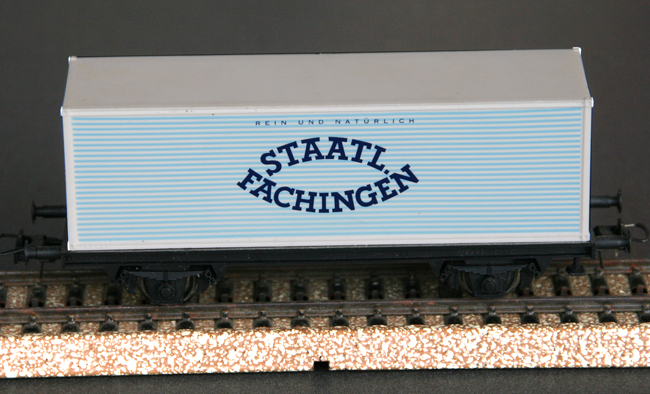 Rare steel-blue livery as used for this class of locomotive assigned to high-speed long-distance 1st class only "F-Zug" trains. 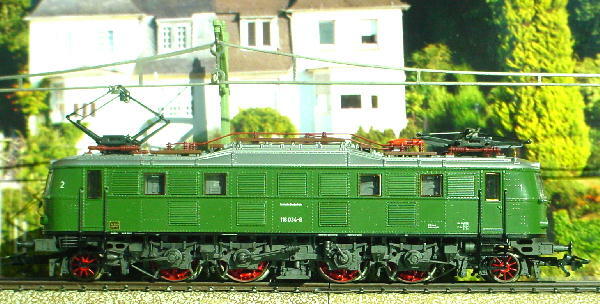 Locomotive is equipped with the high performance motor and can be operated on conventional and digital layouts. Because the locomotive was part of the premium start set 29845 there is no box. Instructions included. A matching set of three cars is available. Click here. Class 120-001-3 electric for high speed passenger trains. Post purchase dealer conversion of 3153 model to 3653 with Digital 6080 module. 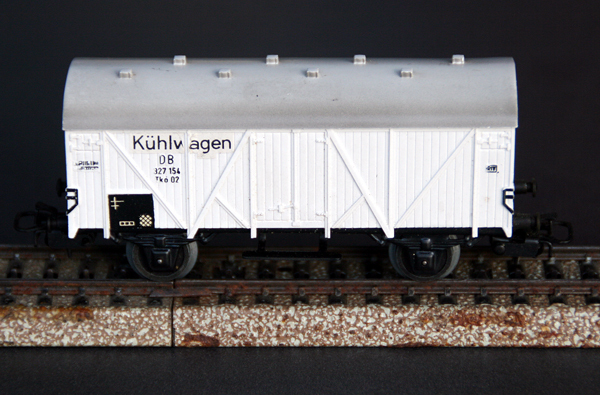 Can be used on conventional, Delta, and Digital Marklin systems. 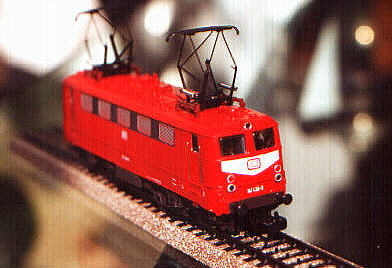 Class 141-430 electric engine from set 2993. Optional Delta module for digital conversion $45.00. 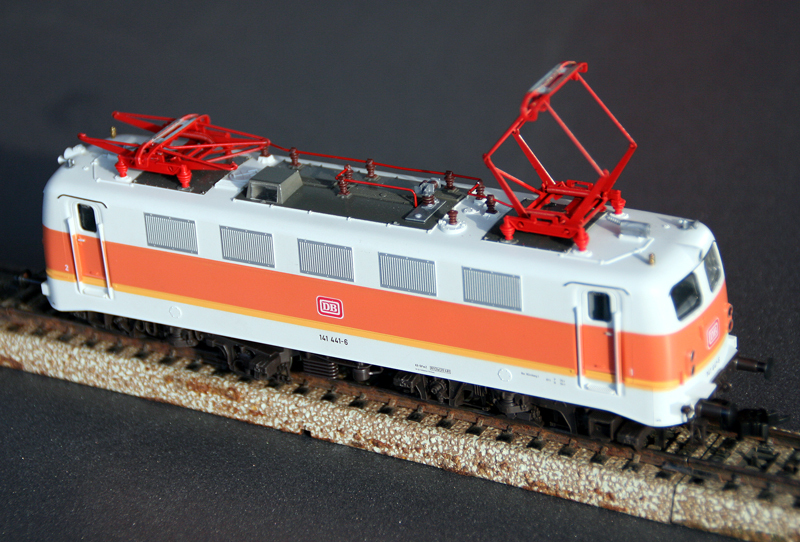 DB class 141-441 in the ivory-orange S-Bahn livery. 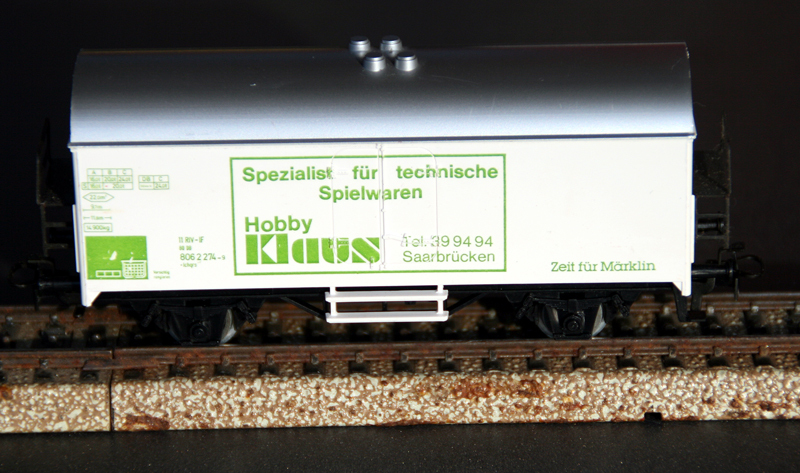 DB class V160-029 diesel locomotive. Typical use is for commuter trains in push-pull operation, but it also found to pull long-distance passenger trains on non-electrified lines, as well as light to medium freight trains. A true universalist. 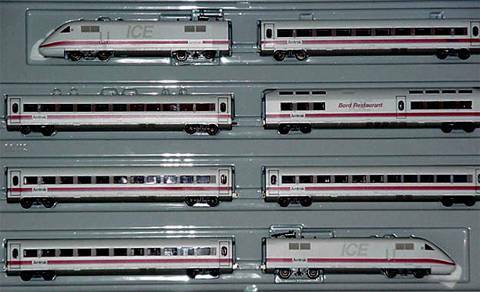 3-rail AC Passenger Train Set (electric) DB Class 111-069-1 electric engine, three coaches and baggage car. 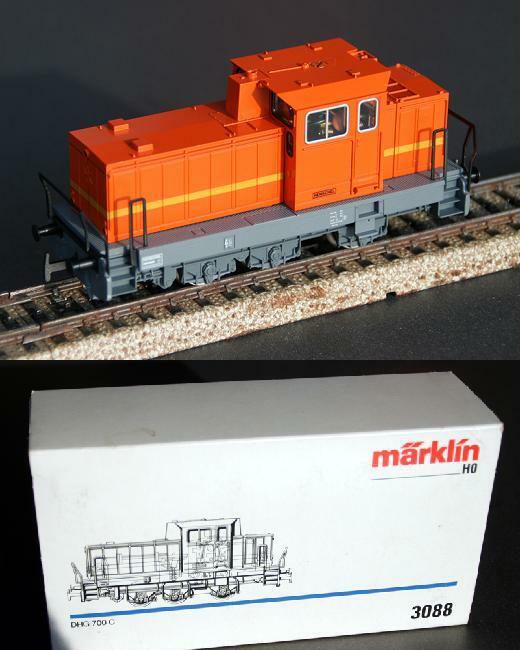 Set includes a Marklin video tape (VHS, European standard or copy for US standard). This is probably Marklin's most colorful train set. 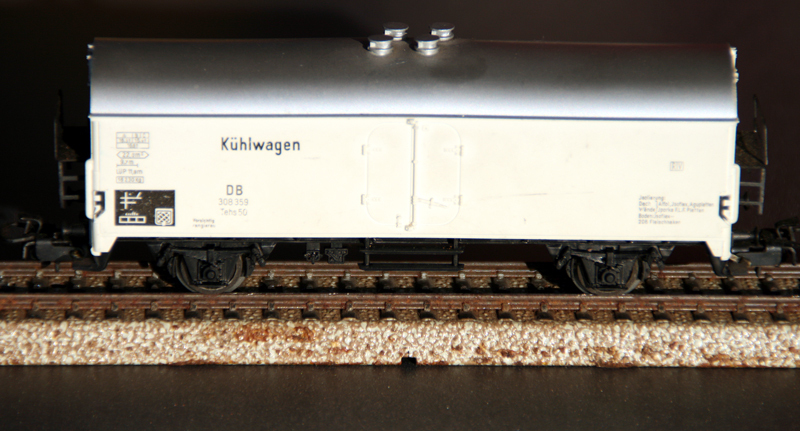 It is the result of a design study that the German Railways (DB) commissioned to Marklin so that they would be able to evaluate the appearance of a planned new color scheme. Rare set. Only made in 1985. 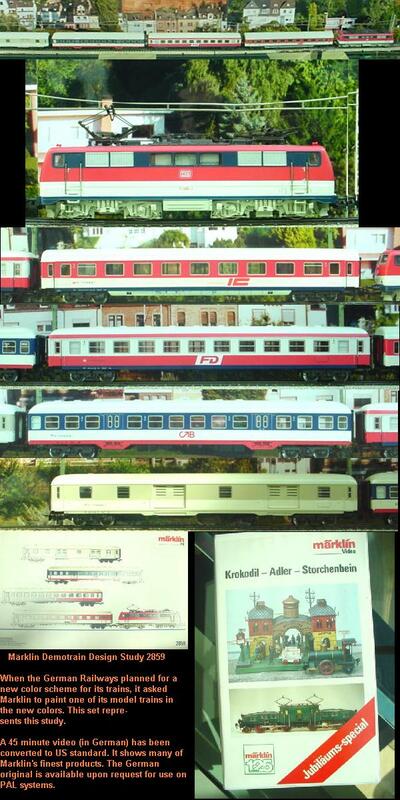 Set of three coaches for "F-Zug" long-distance express trains. 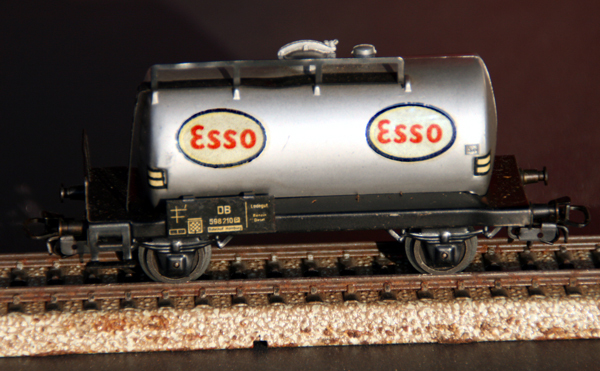 These cars are unused and come from the 29845 premium set, therefore no box. 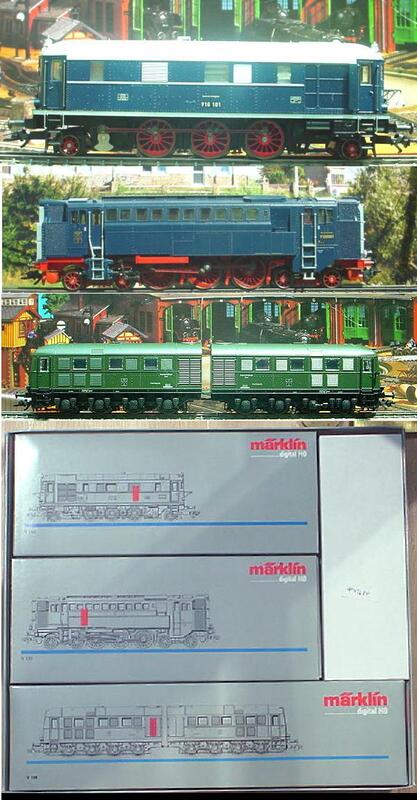 The set is a perfect match to the DB class 03-1022 steam locomotive. Click here. 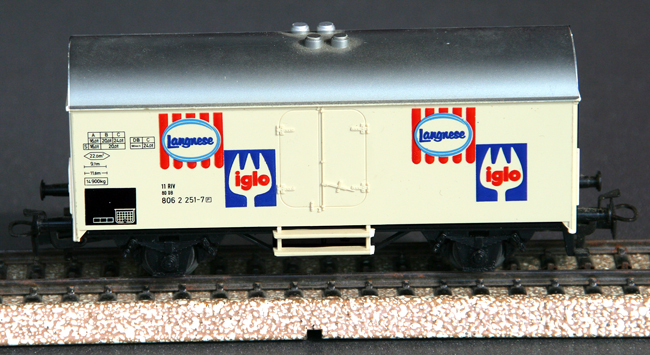 Set of 20 different US reefers, refrigerator, and hopper cars. With US standard RP25 wheels and Kadee compatible couplers. and Marklin compatible couplers required. They are available at cost upon request. The sides of each car are made of tin and are finely printed with spectacular scenes from the United States. Each side contains a different scene. 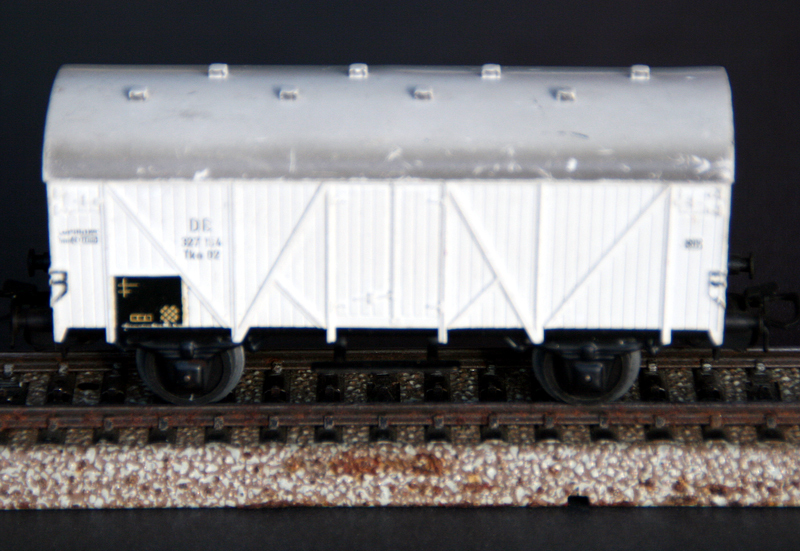 The roofs are also made of tin, with brown plastic running boards. The front and back ends of the cars are made of plastic and colored in the national colors of the USA: Red, white, and blue. Several hundred of miscellaneous "M-track" (straights, curves 5100, short pieces, 80 different electric switches - regular, curved, double-slip, bumpers, uncouplers). Some of these items have been used on a landscaped layout, and there may be differing amounts of paint or landscape material ranging from none to all the way up on the side of the roadbed. 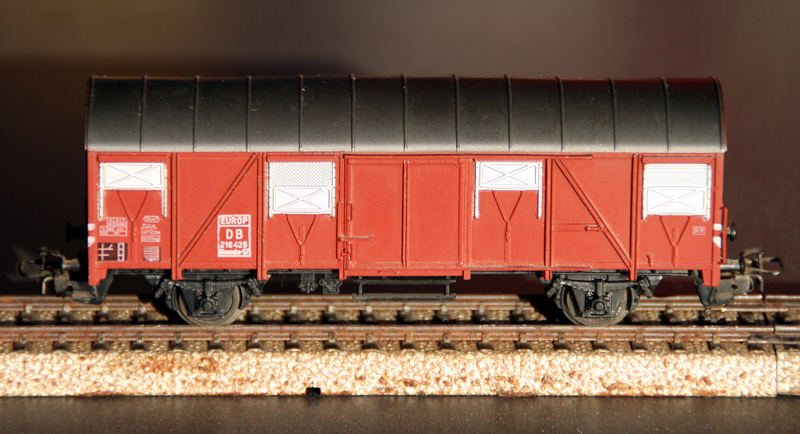 I cleaned the surface of the rails, but there may be some rust on their sides which gives them a nice weathered look. 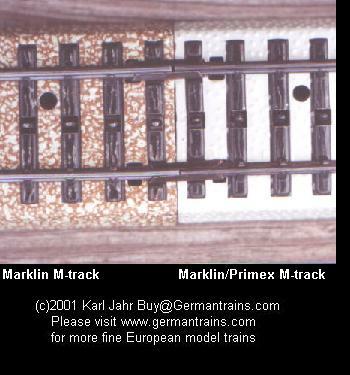 Some track were made by Marklin under its Primex label. They are functionally and geometrically compatible, but have a gray rather than yellowish roadbed. They sell for 10% below regular Marklin items. To see the difference, click here. Mechanically all items are in excellent working condition with no bends or nicks. Electrical and mechanical connectors are in perfect condition. 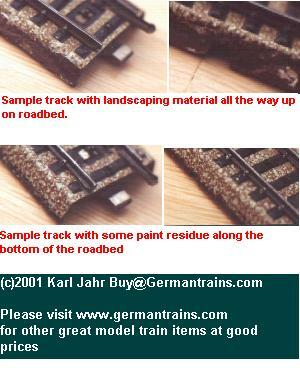 The pictures give representative examples of the condition of the track. and enter catalog number in field "Artikel." Then click on link that begins with catalog no. 120 Volt! Accessory -- 42 Watt transformer for US/Canadian 120 Volt house current. 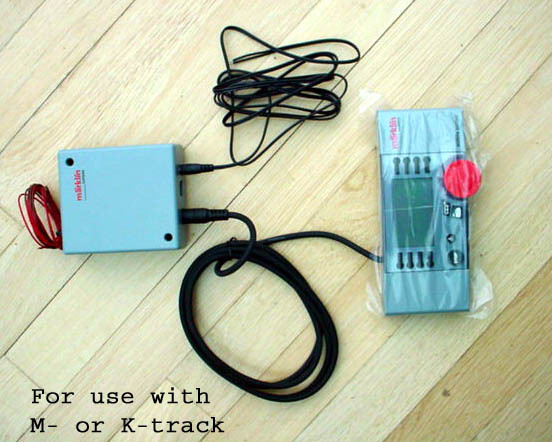 Can be used in connection with the Delta control 6604, Digital Mobile Station 60652, Digital Control Unit 6021, or as power source for light and electro magnetic articles. Can also be used in a booster arrangement with the Delta Control 6604. Send email for details. Accessory -- 1.2Amp Mobile Station for the digital control of up to 10 locomotives and up to 9 switchable functions, including controlled acceleration and braking. 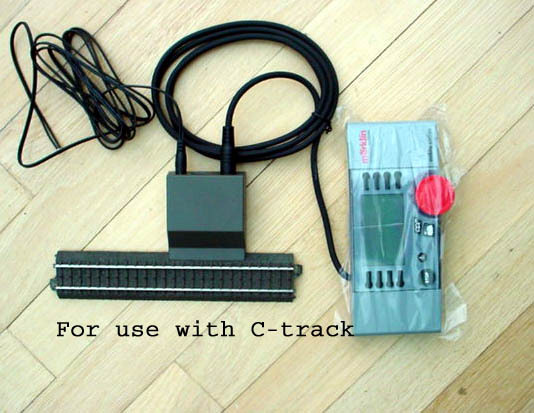 Includes one C-feeder track 24088 and appropriate cables. 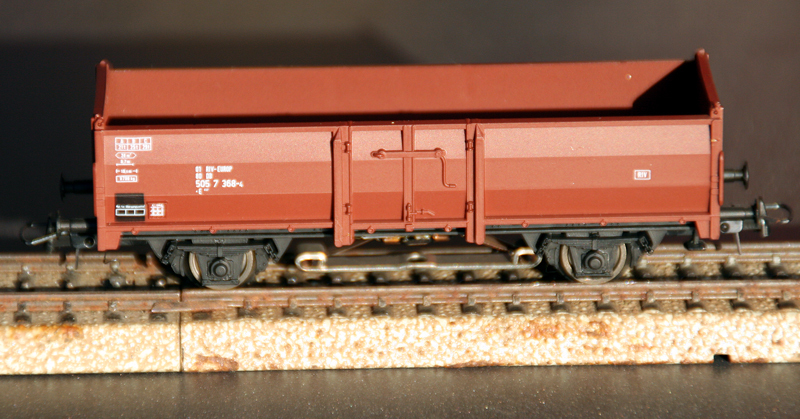 Connection box 60115 for M- and K- track can be substituted for C-feeder track at no extra cost. Never been used. Module comes with wires attached. Installation requires ability to solder. 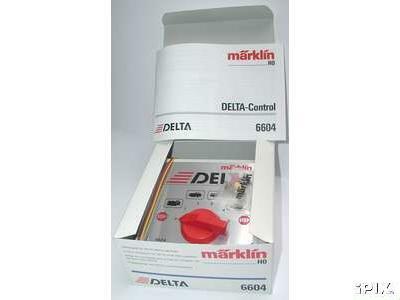 6604 Accessory -- Delta control unit for the control of up to four digital locomotives. 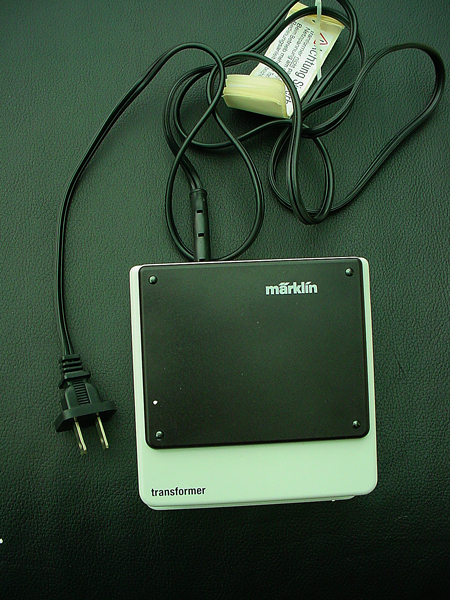 In combination with a transformer it can also be used as a digital booster. 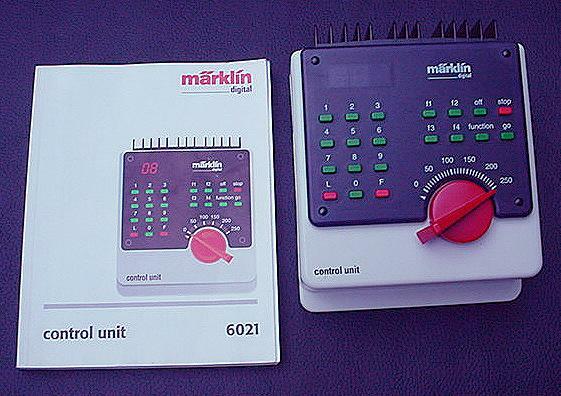 Marklin Accessory --- Digital booster consisting of 120Volt/32 Watt Transformer and Delta control unit 6604. Includes instructions on how to use these as a digital booster. Send Email if you have questions about this capability. I can mail you a wiring plan at no cost. 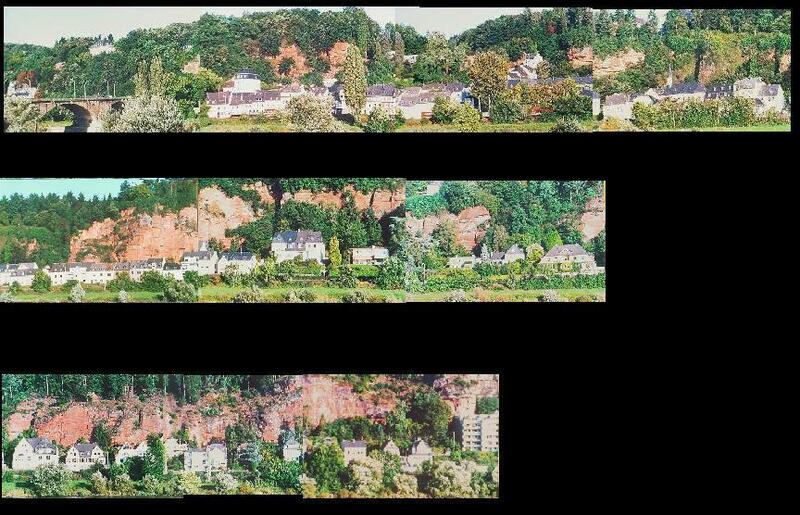 Set of 10 panoramic pictures (12"high x 18"wide/30 x 45 cm) taken by Germantrains of the riverfront of the Mosel in Trier/Germany. After trimming and assembly this set yields a photo realistic backdrop about 13 feet/4 meter for HO systems. All pictures numbered on back for easy assembly. Trimming requires a sharp utility knife and a metal ruler.